The last conference took place on November 23rd - 24th 2017 in Vienna, Austria. Please check back for more information about the next conference at a later date. The assurance of ‘fitness for purpose’ of analytical procedures is a critical part of any process for ensuring drug quality. 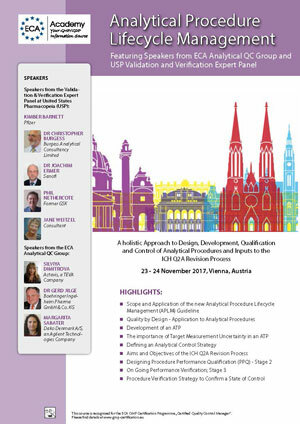 Since 2014, USP’s Validation and Verification Expert Panel has been considering how the modern concept of lifecycle model process validation can be applied to analytical procedures and has published articles and a proposal for a new General Chapter <1220> aligned with the principles of US FDA and EU Annex 15 guidance on process validation. In November 2016, ECA held a joint workshop with USP in Prague to discuss developments. In addition, ICH have instigated a revision workplan for Q2(R1) on Analytical Method Validation scheduled for completion by 2019/2020. Also the new ICH Q12: Technical and Regulatory Considerations for Pharmaceutical Product Lifecycle Management Step 1 Core guideline, June 2017, provides further support for the analytical procedure lifecycle and preparing the way for performance based procedures. In 2017, the board of the ECA’s Analytical Quality Control Group (AQCG) decided to support the lifecycle approach for analytical procedures by drafting a new Guideline on ‘Analytical Procedure Lifecyle Management‘ (APLM). This workshop conference will launch this draft guideline and actively discuss and review it as well as provide inputs for the finalized version 1. In addition, there will be an opportunity to discuss and generate input for the ICH Q2(R1) revision process. The speakers will be from both the ECA board and members of the USP’s Validation and Verification of Analytical Procedures Expert Panel. Conference presentations, case studies and workshop discussions will help participants learn more about the current thinking on lifecycle management of analytical procedures and provide a forum for discussing how to move forward with the transition to and implementation of the lifecycle approach. Click on the Picture to download the complete Programme as a PDF.